I like the new unified look across all the accessories. i’m a huge fan of Apple! Not only do I love to use the Mac Book Pro but I love the packaging designs. I didn’t look at the title of the post and I was still sure it was Apple’s packaging. I guess well done for maintaining such a strong brand via package design! Less is more – simple and nice. 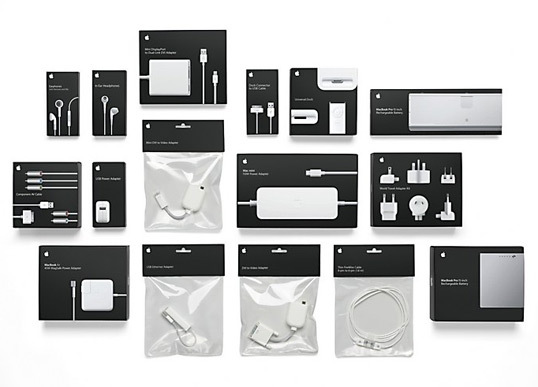 BTW: I want Apple to make products as good as theirs design and packaging. White headphones are just dreadful. Its a sonic nightmare and pops out easily. I cannot believe Johny Ive designed it. I love how well all of the packaging viewed together expands on the story started by any of the products viewed individually. Pretty sweet work as usual from the Apple camp. Love it. So clean and simple. I am impressed with the simplicity of their packaging. Finally, the trends are moving away from gradients, candy graphics and going forward minimalism. I recently bought one of the adaptors and did find the packaging so much better. Very easy to see what it is you have, which is very helpful when you’re looking for something particular. Simple and clean design, plus recyclable material used for it. That’s 21st century indeed. Great work. Its diffeculd to improve apple but you did a nice job with this one!